Joshua Nunn had never been outside the United States before graduate school. In fact, he’d never ridden in a plane. That all changed on a visit to Greenland, a journey that included riding a C-130 military plane. That’s a long way from his hometown of Talladega. And, the weather differences during Greenland’s “summer,” as it’s technically called, and Alabama’s are vast, too. While people sweltered in Alabama’s heat, it never warmed above freezing for the two weeks Nunn and two other researchers from The University of Alabama worked in Greenland. He was there to help drag a one-of-a-kind radar across the Northeast Greenland Ice Stream. Developed and built by UA professors and students, the radar helps scientists unveil ancient climate history and provides perspectives on improving climate models. 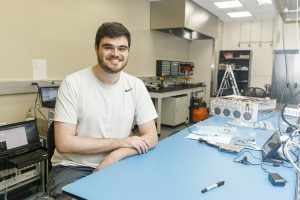 The team included Nunn, along with graduate student Christopher Simpson and Dr. Stephen J. Yan, who specializes in ultra-wideband radar and antenna research. The radar is 1,000 times more sensitive than the current state-of-the-art radar used to image glaciers, operating at a higher power with a bigger, yet lighter, antenna than similar radars for ice sounding, said Yan. The research team was the first to use a radar to image the bottom 10 percent of the ice stream, which is about 1.7 miles deep, Yan said. These results will contribute to developing satellite missions to completely map Greenland and Antarctic ice. Talladega native Joshua Nunn earned his bachelor’s degree in electrical engineering from UA and stayed on for graduate school. Nunn grew up in Talladega and graduated from Victory Christian High School in Pell City, coming to UA to study electrical engineering. 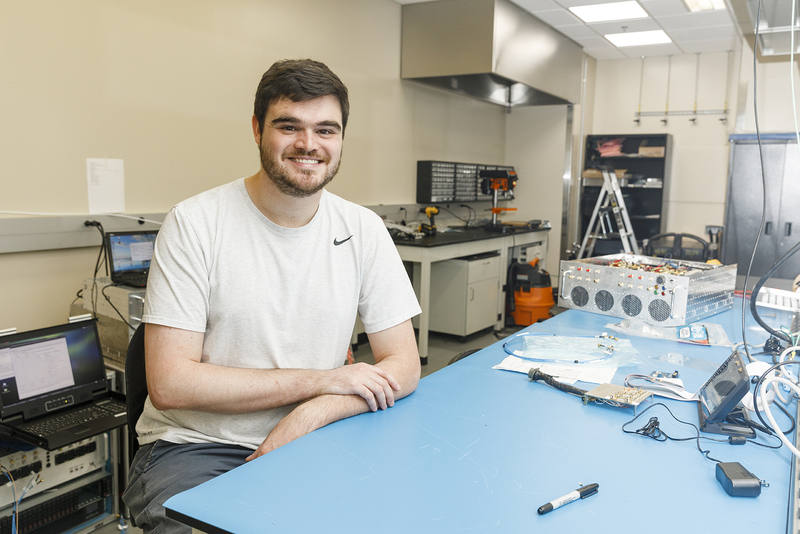 After earning his bachelor’s degree in December 2017, he stayed at UA to get a master’s in electrical engineering. Nunn worked on the radar technology under Yan before the trip, and while in Greenland he used his knowledge to troubleshoot issues and back up data from the radar. 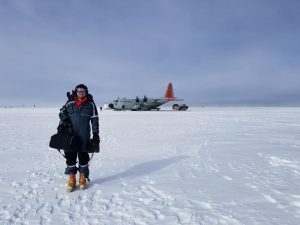 The team stayed on top of the ice stream at a camp housing scientists studying its flow into the ocean. In the middle of white ice, Nunn and the UA team hunkered down at night in a tent with electricity supplied by a generator. Still, one morning, Nunn awoke to find frozen water in a cup beside his bed. The team had internet with Netflix and could call home, too. In a common area under a domed structure, there was space for a kitchen, meals, shower and laundry. An on-site chef served up some of the best food Nunn had ever eaten. It was an international team of scientists and engineers, but everyone spoke English, Nunn said.